One way to use iPads in the elementary library is as part of “stations.” The touch screen and variety of available apps make it a natural for learning stations. One of our elementary librarians and I spent time recently exploring apps for her students, and found some excellent apps that would work well for reading/learning stations in the library. She envisions setting up stations where younger elementary students could record themselves reading, read an audiobook and follow along, or learn the alphabet, among other things. We found a number of excellent apps and instructional ideas from this excellent series of posts from Burley Elementary School in Chicago that set us on a search for inexpensive apps. First up– we discovered Blue FiRe, a free recording app for the iPad. The controls are very simple and intuitive and the app is free. Students can record themselves reading a book and listen back to it, or the library staff could pre-record some book “teasers.” The ease of use of this app is excellent–you can pause the recording or even stop it and go back and add to it later, and it seamlessly stitches the recording together. It stores the recordings in a list, and the titles of the recordings can be edited. They can be exported off of the iPad via FTP. We also decided on the free Alphabet Tracing app, which both allows students to trace their letters, but then also reads aloud the letter and a word associated with the letter; it also allows students to practice eye-hand coordination in tracing their numbers. There is a blank screen where students can write their own letters and words, and it also allows students to customize colors and patterns for their own “pen,” which adds a more creative element to this particular app. The ABC Cursive app is another nice alphabet/writing app. While some may be opposed to emphasizing handwriting, for some students, particularly those with dylexia or other special needs, the eye-hand coordination practice and tracing can be helpful. The new Nook for Kids app is going to be an excellent resource for libraries. The books have a “Read by Myself” or “Read to Me” feature which would be great for library reading stations. It allows you to pause the reading also, allowing the child to really look at the page or stop the “read aloud” and read the page silently. And as a safeguard, the app doesn’t “automatically” allow items to be downloaded when installed; it asks for the parent’s password to either enter the store or change any settings, a nice feature for schools. The color books render very well. There are many other “reading” apps for the iPad of course. Tumblebooks has a variety of individual books available, though we are hoping they will have an iPad app of their own soon. ICDL‘s free app (International Children’s Digital Library) is well done–with hundreds of books and ways to search for the kind of book, language, etc. Of course individual books abound, some free, some not. 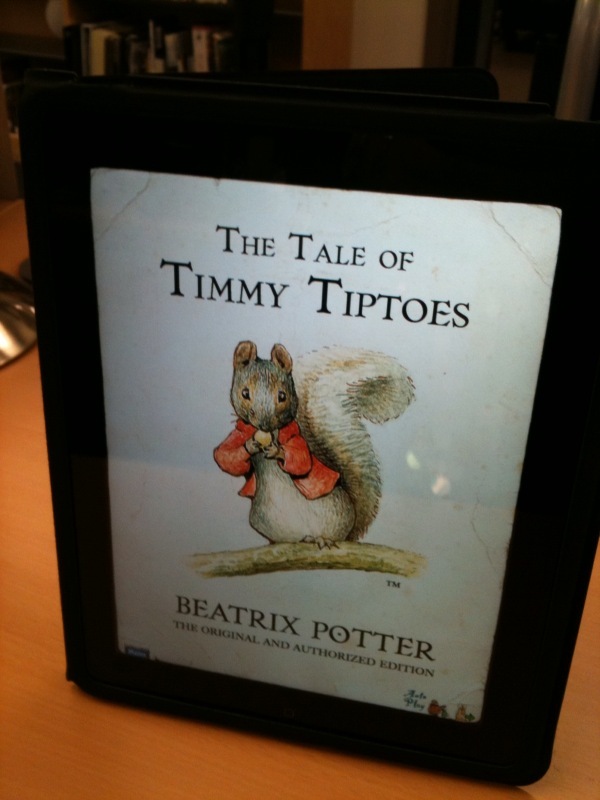 Talkie Books offers Beatrix Potter books, some free, like Tommy Tiptoes, and some for a fee, and each is read aloud. Cooper’s Pack Travel Guide to Seattle is another nice free book app for elementary readers in the middle grades–it uses the more interactive features of the iPad and asks students to interact with the book. Though one of the attractive features about the iPad is its mobility, the use of the touchscreen at “reading stations” allows you to extend the use of an iPad if you have limited numbers of iPads available(or only one), and leverages the power of the apps for student learning and reading. We’ve also come across Tales2Go, an app that has over 1500 audiobooks for the iPad. There is some amazing stuff on it, including the newest Diary of a Wimpy Kid. And affordable as well. I’m very interested to hear how this project works out in your district’s elementary library. I’m wondering how many iPads is really the optimal number to have w/ this type of application. I also wonder about the use of ebooks that are purchased. Any potential copyright problems with this type of use? I truly don’t know–just wondering what the user agreement looks like. I assume that the librarian will purchase a copy of the ebook for each iPad she will use it on? I’m interested in the nuts & bolts of this project so I can begin to make the case for iPads in my world! 🙂 Thanks for the links to Burley too! She is actually only starting off with a few stations, and we have mainly been looking for free apps that allow either for reading or practicing some type of literacy. Kindle and Nook do allow you to purchase a book and use it on five devices (iPads) which is their policy, btw. But there are so many webbased apps too that you can make as home page links on the iPad. So I think the possibilities are pretty endless. 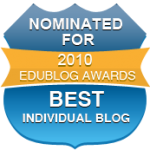 You could use them as “science” stations with links to videos about whatever the students are studying, free science materials online, science apps, etc. You could tailor them to any unit a teacher was doing. I think even two is enough to start with, but a set of five or six might be optimal for small group work on stations. Thanks for sharing the iPad apps! They are excellant! 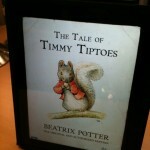 I have also come accross an app ‘Free Books’ that has over 23,469 classic books for the iPad.